What you should do is…Leave ’em hanging high and dry! What do all Trays, Cutting boards and Baking Sheet Pans have in common? All three are critical, must-have tools in any kitchen or foodservice operation. Can be easily washed and sanitized through a dishwasher. Can harbor harmful bacteria if not air-dried properly. You gave your cutting boards a good scrub, first by hand even though you are still going to run them through the dishwasher. You know, just to be safe. Then you run them through your commercial dishwasher, which is fairly effective for thoroughly cleaning and sanitizing them. You use only best cleaning ware-washing chemical agents so it kills off any potential bacteria. You pull your trays out of the dishwasher and stack them together. Voila! Bet you didn’t know that moisture makes your cutting boards, trays and baking sheet pans a breeding ground for bacteria. Also, the humidity can warp these over time and harsh chemical deposits can discolor and deteriorate them prematurely. Storing them upright prevents moisture from remaining on them and avoids bacteria from growing by allowing sufficient air circulation. Whether you use the dishwasher or hand wash, it is highly recommended to stand the board, tray or baking sheet pan on end and let it dry. The proper air flow is important during the drying process before stacking them or putting them away. Looking for a better way to dry your stuff? 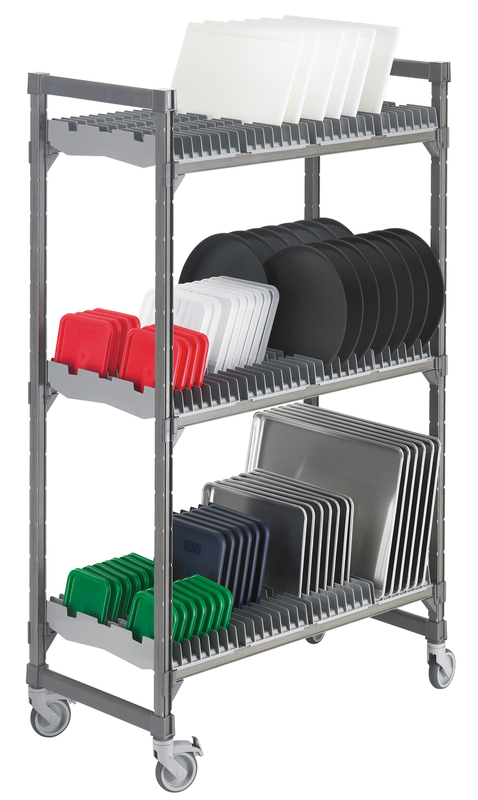 Check out Cambro’s New Drying Rack System perfect for Trays, Cutting Boards, Baking Sheet Pans and Lids!